Students struggling with vocabulary? 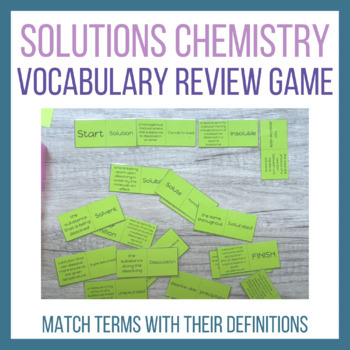 Have them cut out these dominoes or tarsia pieces and string them together to match solution terms with definitions in "easy English" (as opposed to more difficult chemistry language) great for starting out a unit, midpoint assessment or unit review. These cards are "prescrambled" so it is easy to use for sub plans and have the students cut out their own set without giving them the answers. Or you can print and laminate a few sets for your class. I like to print mine on multiple colors of paper to distinguish the sets.